I’ve been craving peanut butter cookies for weeks now and I finally got around to baking some. There’s nothing better than lying on the sofa on a cold grey Sunday afternoon with your favourite book, a cup of tea and some tasty cookies; apart from an afternoon nap maybe! Although I am not a vegan I don’t bake with eggs very much anymore as I want to appreciate the actual taste of an egg when I do eat them and not have them just disappear into the cake batter unnoticed. I have found a great initiative here in Germany called “Bruderhahn” which literally translated means “Brother hen”. The eggs from this initiative cost €0,04 more per egg. The farmers in this initiative receive this extra money to finance raising the male chicks as well. Yes, in the end, they get slaughtered for meat as well but that’s a topic for a different blog post. Back to our cookies which are egg-free and taste fantastic! I found this great recipe by Alison from Loving It Vegan. The cookies are crunchy on the outside and soft and crumbly on the inside. Perfect! Let’s get baking! Cream together the butter/margarine and sugar with an electric mixer. I used the paddle attachment. Add in the peanut butter, vanilla extract and mix together until well combined. Mix together flour, baking soda and salt in a separate bowl. Add the dry ingredients to the wet ingredients and mix with a spoon. I found another recipe which actually does the creaming of butter and sugar with a spoon as well as it apparently makes cookies even more crumblier. Depending on the oil content of your peanut butter you might already have the perfect cookie dough texture at this stage. I pressed the back of my spoon against the mixture and it started to come together. I added 2 tbsp of oat milk in total. Add enough milk so that you can roll the dough into a ball without them falling apart into a crumbly heap. 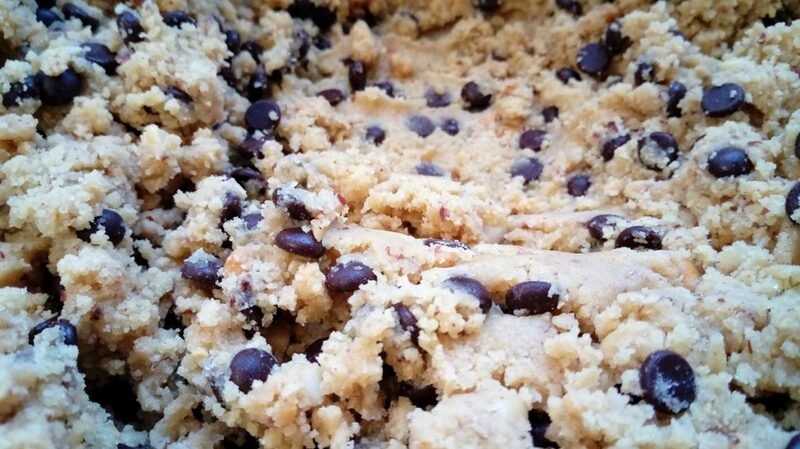 Add in the chocolate chips and mix in. I used an ice-cream scoop to help me get even sized cookies. 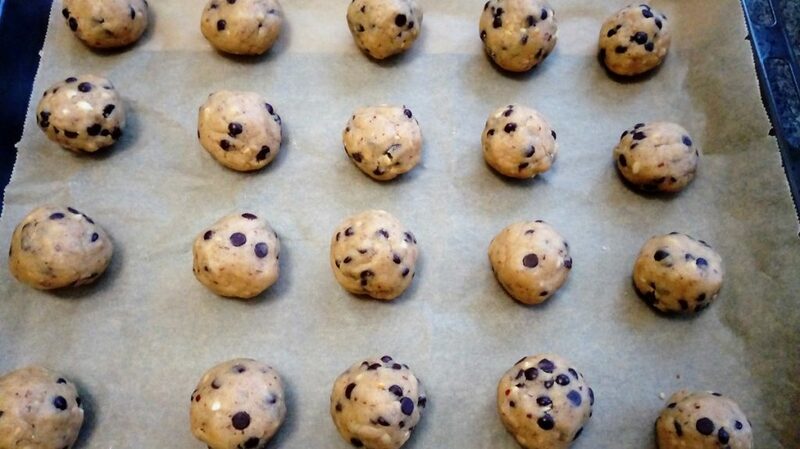 Roll the dough into balls and place onto a baking tray lined with greaseproof baking paper. The recipe makes about 20 cookies plus/minus a couple. Bake for about 15 minutes until the cookie tops are golden brown. Every oven is different so I checked after 10 minutes to make sure they weren’t burning. The cookie dough has come together well after I pressed the back of the spoon against it. Perfect consistency. All rolled up and ready to bake! I ate two cookies at one go! Haha. They were so delicious. As I also had had quite a few nibbles at the tasty raw cookie dough (to die for!) I ended up having a piece of toast for my dinner as I was full up! It was definitely worth it though! Ready baked cookies! The smell is irresistible. Enjoy baking – and eating – these cookies! 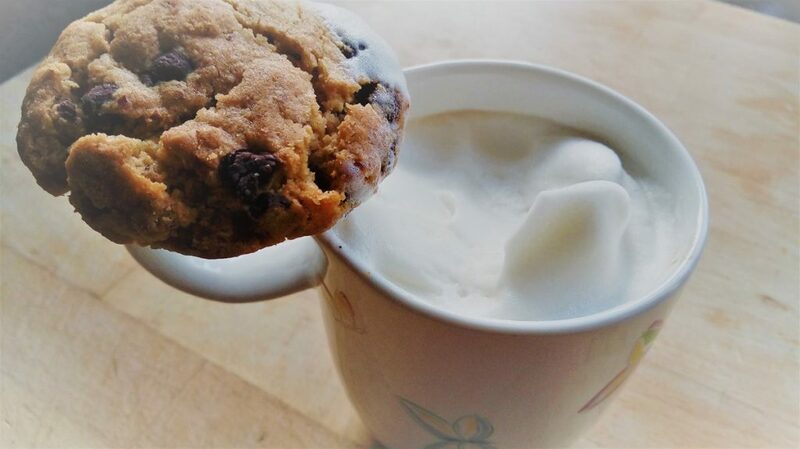 A peanut butter chocolate cookie and a fluffy soy milk cappucino! A dream team! * I substituted 100g of white sugar with soft brown sugar. ** I used crunchy peanut butter. Please use palm-oil free peanut butter. There are many brands which use sunflower oil. Why? Read up here on my thoughts about palm-oil. *** 1,5 cups of the flour I use here in Germany (type 550) actually weighed 200g and not 188g like in Alison’s recipe. Maybe combined with the soft brown sugar which has a heavier texture this shift of ingredients didn’t make the cookies quite as flat as the photos Alison shared on her page. Next time I’ll try 190g but whether thick or thin these cookies are delicious! 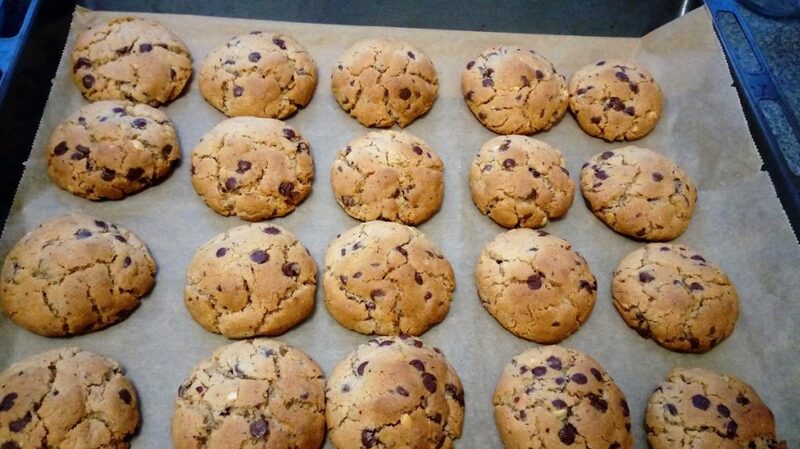 Update 23.2.2019: I baked the cookies today with 190g flour and they turned out fantastic. They spread out a little more than the first time I baked them but they are generally just thick delicious cookies. This entry was posted in Cupcakes & Biscuits and tagged Erdnussbutter, Peanut butter, Vegan.